The main group elements of the periodic table are groups 1, 2 and 13 through 18. Elements in these groups are collectively known as main group or representative elements. These groups contain the most naturally abundant elements, comprise 80 percent of the earth's crust and are the most important for life. Economically the most produced chemicals are main group elements or their compounds. It is in the main group elements that we most clearly see the trends in physical and chemical properties of the elements that chemists have used to understand the "stuff" things are made of. The alkali metals are the series of elements in Group 1 of the periodic table (excluding hydrogen in all but one rare circumstance). The series consists of the elements lithium (Li), sodium (Na), potassium (K), rubidium (Rb), caesium (Cs), and francium (Fr). The alkali metals are silver-colored (caesium has a golden tinge), soft, low-density metals. These elements all have one valence electron which is easily lost to form an ion with a single positive charge. They have the lowest ionization energies in their respective periods. This makes them very reactive and they are the most active metals. Due to their activity they occur naturally in ionic compounds not in their elemental state. The oxides, hydrides, and hydoxides of these metals are basic (alkaline). In particular the hydoxides resulting from the reaction with water are our most common laboratory bases (alkalis). It is from this character that they derive their group name. Hydrogen also has a single valence electron and is usually placed at the top of Group 1, but it is not a metal (except under extreme circumstances as metallic hydrogen); rather it exists naturally as a diatomic gas. Hydrogen can form ions with a single positive charge, but removal of its single electron requires considerably more energy than removal of the outer electron from the alkali metals. Unlike the alkali metals hydrogen atoms can also gain an electron to form the negatively charged hydride ion. The hydride ion is an extremely strong base and does not usually occur except when combined with the alkali metals and some transition metals (i.e. the ionic sodium hydride, NaH). In compounds hydrogen most often forms covalent bonds. Under extremely high pressure, such as is found at the core of Jupiter, hydrogen does become metallic and behaves like an alkali metal; see metallic hydrogen. The alkaline earth metals are the series of elements in Group 2 of the periodic table. The series consists of the elements beryllium (Be), magnesium (Mg), calcium (Ca), strontium (Sr), barium (Ba) and radium (Ra) (though radium is not always considered an alkaline on earth due to its radioactivity). The alkaline earth metals are silvery colored, soft, low-density metals, though are a bit harder than the alkali metals. These elements all have two valence electrons and tend to lose both to form ions with a two plus charge. Berylium is the least metallic element in the group and tends form covalent bonds in its compounds. These metals are less active than the alkali metals, but are still fairly active. They react readily with halogens to form ionic salts, and can react slowly with water. Magnesium reacts only with steam and calcium with hot water. Beryllium is an exception: It does not react with water or steam, and its halides are covalent. The oxides are basic and dissolve in acids and the hydroxides are strong bases, though not as soluable as the alkali metal hydroxides. The alkaline earth metals are named after their oxides, the alkaline earths, whose old-fashioned names were beryllia, magnesia, lime, strontia and baryta. These were named alkaline earths because of their intermediate nature between the alkalis (oxides of the alkali metals) and the rare earths (oxides of rare earth metals). The classification of some apparently inert substances as 'earths' is millennia old. The earliest known system used by the Greeks consisted of four elements, including earth. Later alchemists applied the term to any solid substance that did not melt and was not changed by fire. The realization that 'earths' were not elements but compounds is attributed to the chemist Antoine Lavoisier. In his Traité Élémentaire de Chimie (“Elements of Chemistry”) of 1789 he called them Substances simples salifiables terreuses, or salt-forming earth elements. Later, he suggested that the alkaline earths might be metal oxides, but admitted that this was mere conjecture. In 1808, acting on Lavoisier's idea, Humphry Davy became the first to obtain samples of the metals by electrolysis of their molten earths. The Boron group is the series of elements in group 13 (formerly group III) in the periodic table. It consists of the elements boron (B), aluminium (Al), gallium (Ga), indium (In), thallium (Tl), and ununtrium (Uut) (unconfirmed). In this group we begin to see the changeover toward non-metallic character. First appearing at the top of the group. Boron is a metalloid, it has characteristics intermediate between metals and non-metals, and the rest of the group are metals. These elements are characterized by having three valence electrons. The metals can loose all three electrons to form ions with a three plus charge in ionic compounds, but boron tends to form covalent bonds. The oxides of the metals dissolve in acids so may be considered basic, but aluminum oxide also dissolves in bases. It is amphoteric; that is, it displays both acidic and basic characteristics. This is another indication of the changeover to non-metallic character. Aluminum is the third most abundant element in the earth's crust (7.4 percent), and is widely used in packaging materials. Aluminum is an active metal, but the stable oxide forms a protective coating over the metal making resistant to corrosion. The carbon group is the series of elements in group 14 ([formerly group IV) in the periodic table. It consists of the elements carbon (C), silicon (Si), germanium (Ge), tin (Sn), lead (Pb), and ununquadium (Uuq). This group has a mix types of element with the non-metal carbon, two metalloids, and two metals. The common characteristic is four valence electrons. The two metals, tin and lead, are fairly unreactive metals and both can form ions with a two plus or a four plus charge in ionic compounds. Carbon forms four covalent bonds in compounds rather than form monatomic ions. In the elemental state it has several forms, the most known of which are graphite and diamond. Carbon is the basis of organic chemistry and of biological molecules. Life depends on carbon. One oxide of carbon, carbon dioxide (CO2), dissolves in water to give a weakly acidic solution. Acidic oxides are characteristic of non-metals. Silicon in some respects is similar to carbon in that it forms four covalent bonds, but it does not form the wide range of compounds. Silicon is the second most abundant element in the earth's crust (25.7 percent) and we are surrounded by silicon containing materials: bricks, pottery, porcelain, lubricants, sealants, computer chips, and solar cells. The simplest oxide, silicon dioxide (SiO2) or silica, is a component of many rocks and minerals. The Nitrogen group is the series of elements in group 15 (formerly Group V) of the periodic table. It consists of the elements Nitrogen (N), Phosphorus (P), Arsenic (As), Antimony (Sb), Bismuth (Bi) and ununpentium (UUp) (unconfirmed). The collective name pnicogens (now also spelled pnictogens) is also sometimes used for elements of this group, with binary compounds being called pnictides; neither term is approved by IUPAC. Both spellings are said to derive from the Greek πνίγειν (pnigein), to choke or stifle, which is a property of nitrogen. These elements all have five valence electrons. Nitrogen and Phosphorous are non-metals. They can gain three electrons to form fairly unstable ions with a three minus charge, the nitride and phosphide ions. In compounds they more often form covalent bonds. Though not in the top ten most common elements in the earth's crust they are very important elements. Nitrogen, as a diatomic molecule is the major constituent of air and both elements are essential for life. Nitrogen comprises about 3 percent of the weight of the human body and phosphorous about 1.2 percent. Commercially, these elements are important for fertilizers. Arsenic and Antimony are metalloids, and bismuth is the only metal in the group. Bismuth can lose three electrons to form an ion with a three plus charge. Bismuth is also the heaviest completely stable element that does not decay radioactively to other simpler elements. The chalcogens (with the "ch" pronounced with a hard "c" as in "chemistry") are the name for the periodic table Group 16 (formerly Group VIb or VIa) in the periodic table. It is sometimes known as the oxygen family. They are oxygen (O), sulfur (S), selenium (Se), tellurium (Te), the radioactive polonium (Po), and the synthetic ununhexium (Uuh). The compounds of the heavier chalcogens (particularly the sulfides, selenides, and tellurides) are collectively known as chalcogenides. Unless grouped with a heavier chalcogen, oxides are not considered chalcogenides. The name chalcogen is generally considered to mean "ore former" from the Greek chalcos "ore" and -gen "formation." Chalcogenides are quite common as minerals. For example, FeS2 (pyrite) is an iron ore and AuTe2 gave its name to the gold rush town of Telluride, Colorado in the United States. The halogens are the elements in Group 17 (formerly Group VII or VIIa) of the periodic table. They are fluorine (F), chlorine (Cl), bromine (Br), iodine (I), astatine (At) and the as yet undiscovered ununseptium (Uus). These elements all have seven valence electrons. This group is the first one to consist of entirely non-metals. They exist as diatomic molecules in their natural state and have a progressive variation of physical properties (see table below). Fluorine and chlorine exist as gases at room temperature, bromine as a liguid, and iodine as a solid. They require one more electron to fill their outer electron shells, and so have a tendency to gain one electron to form a singly-charged negative ions. These negative ions are referred to as halide ions, and salts containing these ions are known as halides. Halogens are highly reactive, and as such can be harmful or lethal to biological organisms in sufficient quantities. Fluorine is the most reactive and the reactivity declines as we go down the group. Chlorine and iodine are both used as disinfectants. In their elemental state the halogens are oxidizing agents and are used in bleaches. Chlorine is the active ingredient of most fabric bleaches and is used in the production of most paper products. The oxides and hydrides, like those of most non-metals, of the halogens are acidic. Halide ions combined with single hydrogen atoms form the hydrohalic acids (i.e., HF, HCl, HBr, HI), a series of particularly strong acids. (HAt, or "hydrastatic acid," should also qualify, but it is not typically included in discussions of hydrohalic acid due to astatine's extreme instability toward radioactive alpha decay.) They can react with each other to form interhalogen compounds, and can combine with oxygen in polyatomic oxoanions. Diatomic interhalogen compounds (BrF, ICl, ClF, etc.) bear strong superficial resemblance to the pure halogens. Many synthetic organic compounds, and a few natural ones, contain halogen atoms; these are known as halogenated compounds or organic halides. Chlorine is by far the most abundant of the halogens, and the only one needed in relatively large amounts (as chloride ions) by human beings. For example, chloride ions play a key role in brain function by mediating the action of the inhibitory transmitter Gamma-aminobutyric acid (GABA) and are also used by the body to produce stomach acid. Iodine is needed in trace amounts for the production of thyroid hormones such as thyroxine. On the other hand, neither fluorine nor bromine are believed to be really essential for humans, although small amounts of fluoride can make tooth enamel resistant to decay. The term halogen was coined to mean elements which produce salt in union with a metal. It comes from eighteenth century scientific French nomenclature based on erring adaptations of Greek roots. Table of trends in melting point, boiling point, and electronegativity. * Ununseptium has not yet been discovered; values are either unknown if no value appears, or are estimates based on other similar elements. The noble gases are the chemical elements in group 18 (formerly group VIII) of the periodic table. They are helium, neon, argon, krypton, xenon, and radon. They are sometimes called inert gases or rare gases. The name 'noble gases' is an allusion to the similarly unreactive Noble metals, so called due to their preciousness, resistance to corrosion and long association with the aristocracy. The noble gasses are all non-metals and are characterized by having completely filled shells of electrons. In general this makes them very unreactive chemically since it is difficult to add or remove electrons. Physically they exist as monatomic gases at room temperature, even those with larger atomic masses (see table of physical properties below). This is because they have very weak inter-atomic forces of attraction, and consequently very low melting points and boiling points. Krypton and Xenon are the only noble gasses that form any compounds at all. These elements can do this because they have the potential to form an expanded octet by accepting electrons in an empty d subshell. Because of their unreactivity, the noble gases were not discovered until 1868, when helium was detected spectrographically in the Sun. The isolation of helium on Earth had to wait until 1895. The noble gasses are commonly encountered in helium balloons (safer than flammable hydrogen) and lighting. Some of the noble gases glow distinctive colors when used inside discharge tubes (neon lights), and Argon is often used inside filament light bulbs. Table of trends in melting point, boiling point, and density. * Ununoctium has not yet been discovered; values are either unknown if no value appears, or are estimates based on other similar elements. All links retrieved February 9, 2019. 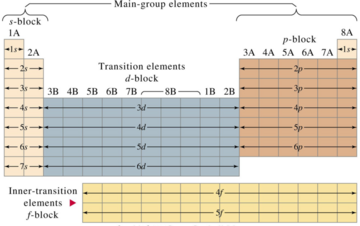 History of "Periodic table, main group elements"
This page was last modified on 9 February 2019, at 21:57.